You are viewing One of our newest additions! 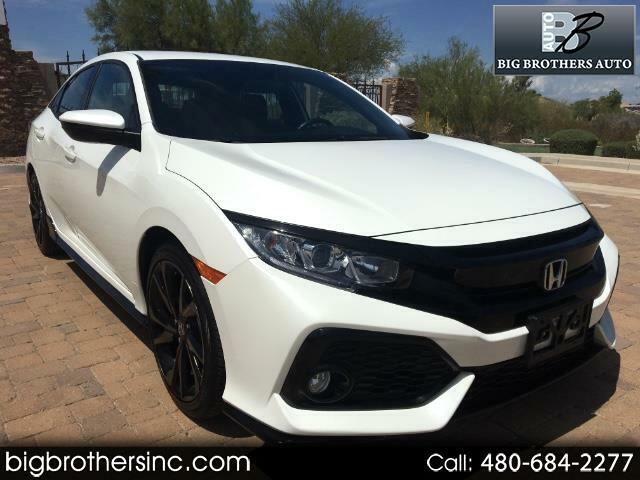 2018 Honda Civic Sport 2.0L Turbo with only 2400 miles! This vehicle comes equipped with convenient features including: 6sp Manual transmission, power windows, power locks, cruise control, back up camera, Bluetooth audio with satellite option, electronic emergency brake system, alloy wheels, fog lights, economy mode for increased MPG and much more! If your looking for an almost new honda for thousands less than the competition, then look no further than Big Brothers Auto. This vehicle does come with a restored brand on the title, due to a previous insurance claim. It has passed the DMV level 3 inspection process. We have also put this and every one of our cars through an extensive multi level inspection process to ensure all of our customers receive a turn key used vehicle with no worries. Please call or text John at 602-684-0202 with any questions, or if you would like to come out to see and test drive this vehicle.